simple walk-in rate cheaper than agoda. Well 1st it is not in town, it's about 5 KM south, There isn't an english sign so it's near impossible to spot from the road, they didn't have our booking, they didn't speak engislh and we had to talk to them via a cell phone interpreter, the bungalow was nice but we found their were two ant colonies living under the hut, they came for a visit later on. So if your in to entomology this is your spot! The room is located next to the main road whic is so noisy whole night. Not hot water, it did not work. dirty room, dirty toilet, noisy, uncleaned bed, more expensive, the information on agoda differs from the real place It was terrible night. The resort hotel is beautiful though we could not expect too much for a resort hotel. Comfortable enough for a resort hotel. The breakfast was surprisingly good though just congee and side dishes were provided. We loved the large bedroom, unique bathroom and peaceful location. Ban Kiangdoi is located outside the town of Mae Hong Son so you will need your own transport. It is definitely not you average hotel. Each room is individually designed. Our bungalow was very spacious and the bathroom was amazing. It was like taking a shower in a garden but with complete privacy. We had good WiFi connection, tea and coffee and even a multi-prong power board for our own appliances. There is a cafe near the checkin desk but when we came for breakfast we were told there was no food. This might have been a language issue but in the end we didn't eat there. We chose to stay in an air-conditioned room so we had a retreat from the heat. This room also had 2 large beds in it so it would be good for families. Overall, Kiangdoi was great value for money and a unique experience. The hotel is some distance south of the town and is a good stop-over for exploring the area if you have your own transport, otherwise it's too isolated if you are relying on public transport. 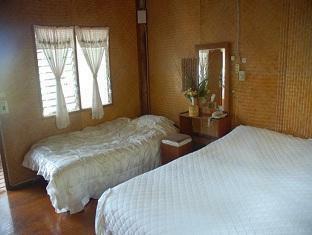 The hotel is an old style Thai resort, set in the countryside a few kilometers from town. The decor was thoughtfully planned with lots of little details, such as a garden in the bathroom. It is a nice place for some peace and quiet, but there is karaoke some nights. The rooms need a good clean to remove all of the cobwebs and dust. Since, it is outside of town there are no restaurants so not ideal if one doesn't have transportation. The hotel had one, but we didn't try it. The c mini mart carried everything. Large jungle style hotel 7km outside of the main town. Lots of outdoor space, perfect for us as we had our dog with us, the hotel is pet friendly. Rooms are clean but downside is the bathroom. It had large spiders and frogs inside, the shower didn't get hot either. good to have your own transport to stay here. We stayed at Ban Kiangdoi for just 1 night and in that time the staff went above and beyond to help us. Our car broke down 30km outside of MHS and having to leave the car by the side of the road and flag down a ride into town, we arrived late and stressed. The staff then drove us into the town so we could get some dinner. In the morning, the owner rung a mechanic for us and arranged for someone to drive us to town, took us to a car part shop, mechanic and a bike rental company so we could get back to our car. We ended up checking out an hour late and there were no issues. We were travelling with our dog as the hotel is pet friendly, there is lots of outdoor space and the rooms are large with interesting 'jungle' style bathrooms. We have booked to stay another night here in a couple of weeks with friends...lets hope the car makes it this time! The hotel is about 6km from the town, so ideally need your own transport to stay here. Nice and relaxing surroundings. But it is placet 7 km out off town, so you will need scooter or car. But the staff was very kind to drive us to airport and som on. Clean rooms built with re-cycled materials on hiilsides. Towels and bed linens are better than some 5 stars hotels in big cities. Run by a small family headed by a sweet and young lady with her boyfriend. Services is excellent. Good dinner and breakfast at reasonable prices. Not suitable for senior citizens. This is one of the cheap and super good hotel I even stay. Apart from it location which is about 5 mins drive away from town (which I am driving) there isn't any other things that I don't like. The only trouble is that I can't read and speak Thai and the main entrance is written in Thai word, so if you couldn't read Thai, please be prepare to look for the hotel with a guide. Recommended to stay. One more thing, you can experience bathing like inside a forest with all the real plants surronding you - better than the 6-stars hotel.